We continue our NoNoHitters 30 countdown today with the team that took more than a half century to finally get one, the New York Mets. The 8,019-game streak began on April 11, 1962, when the St. Louis Cardinals’ Julian Javier singled to left off Mets starter Roger Craig during the Mets franchise’s first major league game. It ended on June 1, 2012, in the team’s 51st season in the National League, when Johan Santana scattered five walks and struck out eight during the 8-0 no-hit victory over the St. Louis Cardinals. A Mets pitcher never hurled a no-hitter before Johan? That’s correct. A pitcher on the mound for the New York Mets never threw a no-no before 2012. Really? What about Ryan, Seaver and guys like that? Yes, Nolan Ryan pitched seven no-hitters during his Hall of Fame career, but they all came after he was traded by the Mets. And Tom Seaver finally got his sole no-hitter as a Cincinnati Red during his first season away from the Mets. In fact, seven former Mets pitched no-hitters after leaving New York. Mike Scott (Houston Astros), Dwight Gooden (New York Yankees) David Cone (Yankees), Hideo Nomo (Boston Red Sox) and Philip Humber (Chicago White Sox) round out the list. Click here for more details. Were there also Mets pitchers who threw no-hitters prior to joining the Mets? Yep. Don Cardwell (Chicago Cubs), Warren Spahn (Milwaukee Braves), Dean Chance (Minnesota Twins), Dock Ellis (Pittsburgh Pirates, while tripping on acid), John Candelaria (Pittsburgh Pirates), Bret Saberhagen (Kansas City Royals), Al Leiter (Florida Marlins), Scott Erickson (Minnesota Twins), Kenny Rogers (Texas Rangers) and Hideo Nomo (Los Angeles Dodgers) all did it. Note that Nomo is the only pitcher to hurl no-nos before and after his stint with the Mets. 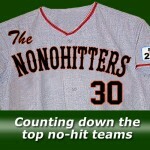 Click here for more details on this group’s no-hitters. There must be pitchers that have no-hit the Mets, right? You are correct. Six pitchers have thrown no-hitters against the Mets during their years of existence. This group includes Sandy Koufax, Jim Bunning, Bob Moose, Bill Stoneman, Ed Halicki and Darryl Kile. Click here for more details on these games. No. The Mets streak lasted 50+ seasons. The Philadelphia Phillies were void of a no-hitter for 58 years, 1 month, 18 days between 1906 and 1964. The 8,945-game-long streak began on May 3, 1906, one game after Phillies’ southpaw Johnny Lush threw a 6-0 no-hitter against the Brooklyn Superbas. It ended on June 21, 1964, when Jim Bunning threw a 6-0 perfect game against the Mets during a Father’s Day doubleheader at Shea. So are the Mets really cursed? How did that happen? Well it’s no surprise that the Mets didn’t throw a no-hitter through most of the 1960s as they simply weren’t that good of a team. But with Ryan, Seaver, Jerry Koosman and Jon Matlack on the roster, the Mets surely had enough talent on the roster from the late 1960s to the mid 1970s to get it done. Some trace the curse back to Dec. 10, 1971, when the Mets traded Nolan Ryan along with pitcher Don Rose, catcher Francisco Estrada and outfielder Leroy Stanton to the California Angels for infielder Jim Fregosi. Ryan went on to throw seven no-nos and the Mets remained without until 2012. I’m pretty sure the Mets had some one-hitters, right? Yes, 38 to date, including two taken into the ninth inning by Tom Seaver. Most recently, Matt Harvey and Bobby Parnell one-hit the Chicago White Sox over 10 innings on May 7, 2013. See the full list here.